Even the most modern and beautiful kitchen can have a hidden problem: a lack of storage space. No matter how big your kitchen may have seemed when you first moved in, there never seems to be enough storage space for all of your kitchen tools and gadgets, especially as the years go on and you accumulate more items. 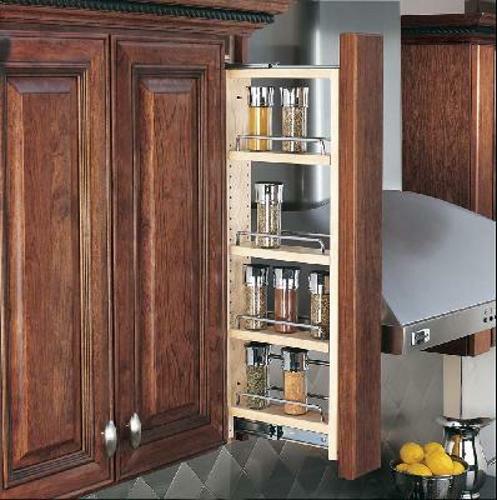 Fortunately, there are a number of easy and affordable solutions to a lack of kitchen cabinet space. Nothing is more irritating than needing a particular pot or a pan and having to dig through a gigantic, sloppy stack of cookware in your kitchen cabinet. When you finally find the right piece, you undoubtedly trigger a cookware avalanche as you pull it out. Rev-A-Shelf cookware organizers can easily solve this problem. These sturdy and easy-to-install organizers help you maintain order in your kitchen cabinets. Anyone who's spent time in a kitchen knows the hassle and frustration of having to sort through countless kitchen accessories in search of one particular item, only to eventually find it all the way in the back of the cabinet after you've emptied everything out onto the counter or floor. A simple shelf organizer fits easily in your cabinet or on a pre-existing shelf and slides out like a makeshift drawer. Not only does this make your items easier to find and reach, but easier to store and organize as well. If you're undergoing a kitchen renovation, consider a wall cabinet filler or base cabinet filler. These helpful kitchen accessories won't fit into an existing cabinet but are a smart idea for installing into new construction. They come with adjustable shelves and slide out on ball-bearings for convenient storage and easy access to your kitchen tools. Whether you have one out on your kitchen table to hold napkins and condiments, tucked away in a cabinet holding spices or ingredients, or placed in the fridge to hold beverages or other perishables, Lazy Susans are one of the most convenient kitchen storage accessories available. Just give them a quick spin, and the item you need is at your fingertips. Lazy Susans can attach to a cabinet door or sit freely where you choose. Chances are, you aren't fully utilizing all of your cabinet space. Yes, your kitchen cabinets are likely jam-packed with accessories or food items, but what about the space on the cabinet doors? Door storage is usually shallow, but it's important to utilize all of your available space, and that includes your cabinet doors. Storage that attaches to the inside of your cabinet doors is a great way to stash things like plastic grocery bags, cleaning supplies, spices, or even a cutting board. A pull-down shelf is the perfect solution for those hard-to-reach areas. Many people don't store important items in their highest kitchen cabinets because they can be hard to reach, so frequently retrieving items from up top can be quite a hassle. With a pull-down shelf mounted inside of high cabinets, you can pull down the shelving insert to bring your items down to a more manageable level. This type of durable and convenient storage option is great for any high storage space in your home, not just the kitchen. It's not always easy to pull kitchen tools off of the shelf, particularly if they're heavy and not stored at counter level. The Rev-A-Shelf Heavy Duty Mixer Lift is the perfect way to store and retrieve a KitchenAid-style mixer or a small kitchen appliance. 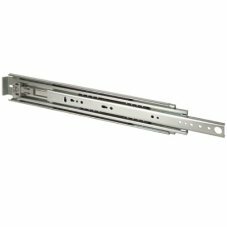 The arm of the mixer lift can easily bring your appliance from a lower level cabinet to counter level in a matter of seconds so you don't have to struggle with picking it up and moving it to the proper area for use. When you're done with the mixer or appliance, simply lower the arm back down into the cabinet. Dealing with a small kitchen can be stressful. Your kitchen could look great at first glance, but be quite a mess behind those cabinet doors and drawers. Even the most spacious kitchen can suffer from storage space problems, and not only is it hard to find a home for all of your kitchen tools and accessories, but when it comes time to actually use them, digging them out in a timely manner and without making a mess is a tall task. However, with the right organizers and storage solutions, you can maximize your available kitchen space in an easy and affordable manner.